ACFCCA is a non-profit association for licensed child care professionals who work for the benefit of the children in care, fellow providers, and our community's needs. Licensed family child care is a vital part of every community. Child care providers are only now beginning to receive the recognition that they have long deserved. To offer a support system for providers in Arapahoe county. To enhance and promote professionalism among child care providers. To act as liaison between providers and child care advocates, including the Department of Human Services. To further educate providers and parents in all areas of child care and to offer a complete resource of the continuing education available. To have a voice in family child care rules and regulations at both the county and state levels. To affect pertinent legislation at both the state and national levels. 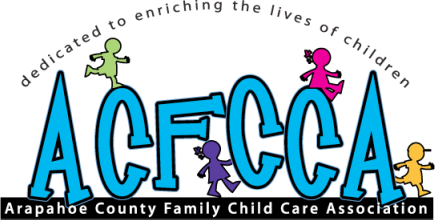 ACFCCA is an affiliate of the Colorado Association of Family Child Care (CAFCC). We have board members who as our state representatives, attend the monthly state meeting in order to vote on issues representing our membership and to keep us informed of legislation concerning our profession.